Have You Heard Of Wu-Wei? I was first introduced to Wu-Wei during my first Glow Kauai Spiritual Retreat in October 2015. Adrian Nicholas of Kalewa Kauai, the spiritual retreat company who is our ambassador for this retreat, shared what it meant. Therefore, he asked each of us to work with Wu-Wei during our time together in Kauai and to carry it into our lives when we went back home. Wu-wei is a Chinese word and implies action that is spontaneous, natural, and effortless. Wu-wei refers to behavior that arises from a sense of oneself as connected to others and to one’s environment. It is not motivated by a sense of separateness. It is action that is spontaneous and effortless. A different way to live and look at life than we generally learn growing up. Also, at the same time it is not to be considered inertia, laziness, or mere passivity. Rather, it is the experience of going with the grain or swimming with the current. Our contemporary expression, “going with the flow,” is a direct expression of this fundamental principle, which in its most basic form refers to behavior occurring in response to living in the flow. The principle of wu-wei contains certain implications. Foremost among these is the need to consciously experience ourselves as part of the unity of life. Hence we must be quiet and watchful, learning to listen to both our own inner voices and to the voices of our environment in a non-interfering, receptive manner. These are things I talk about constantly. 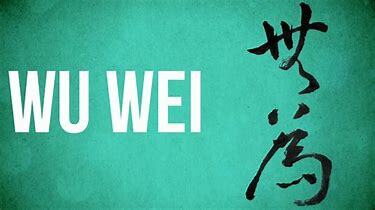 I do my best to live within Wu-Wei throughout my day. In this way, we also learn to rely on more than just our intellect and logical mind to gather and assess information. We develop and trust our intuition as our direct connection to God and the Universe. We heed the intelligence of our whole body, not only our brain. And we learn through our own experience. While all of this allows us to respond readily to the needs of the environment, which of course includes ourselves. Living within Wu-Wei produces a harmony and balance, inside of us and with our actions as well. Consequently, this behavior simply flows through us because it is the right action, appropriate to its time and place. It is serving the purpose of greater harmony and balance. This means trusting our own bodies, our thoughts and emotions, and also believing that the environment will provide support and guidance. Thus the need to develop watchfulness and quietness of mind. Wu-Wei is listening carefully within, as well as to our surroundings, by remembering that we are part of an interconnected whole(The Universal Law of Divine Oneness). As a result, by remaining still until action is called forth, we can perform valuable, necessary, and long-lasting service in the world while cultivating our ability to be one with God and the Universe. Such is the power of wu-wei, allowing ourselves to be guided. Listen. Slow down. Pay attention. Meditate. Quiet your mind. Tune in. What do you think? Are you allowing yourself to live within Wu-Wei, even part of the time? PS. 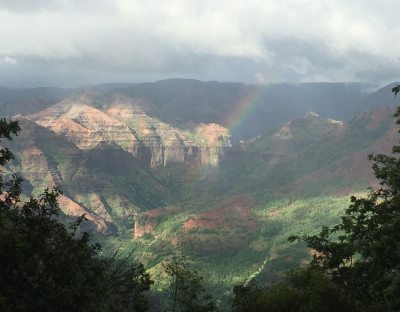 If you would like to practice living in Wu-Wei with me and a small group of people in paradise, our Glow Kauai Spiritual Vacation Retreat is just experience for you! October 5-12, 2018 we will be having the trip of your lifetime on an old sugar cane plantation on the gorgeous island of Kauai. We will be pampered with massage, meditation, yoga, organic food prepared by our chef, exploring the energy and glory of this unique island. I will be sharing with you 10 of my favorite Universal Laws to transform your life. Everything is done outside in nature. Because this setting is not in a hotel, we are in cottages all within steps from the ocean, we get to enjoy nature all of the time. Contact me back today to discuss this amazing retreat!